This is really cool, I didn't realize that Zombie Master was an uncommon. I feel like you need more Contaminated Ground , Evil Presence and Tainted Well - you're sitting on a goldmine with that Swampwalk for everyone ability, you just need to give people some swamps. Those cards are probably much much better than Relic Putrescence and Death Watch at least. 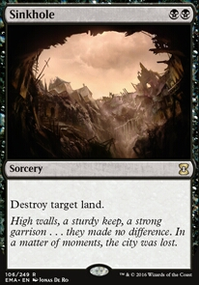 I would prefer sideboarding most actual land destruction spells, since they are usually 3 drops and a ton of decks can already function on 1-3 lands (ex: Burn, Infect, Affinity, any deck with Aether Vial ). Also splashing black for things like Evil Presence and Contaminated Grounds may be worth it although I don't know if they would be worth adding. maybe Victim of Night might be better than Chainer's Edict ? 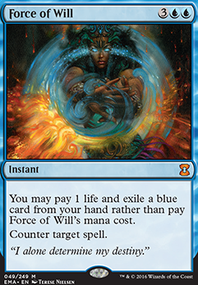 Evil Presence might be a neat SB card for slowing nonblack foes... Virulent Swipe could be a neat tool too. I will say, land destruction is my least favorite mechanic. I understand why it exists, and in some cases it is necissary. that said, blink-riders in standard was one of the few times that I ended up taking over a year long break from magic. oddly, land hate wans't always (or even primarily) red. black and blue had some solid hozing abilities right at the start. oddly enough, the color pie was really into opposing color hate and ally color help at the start. 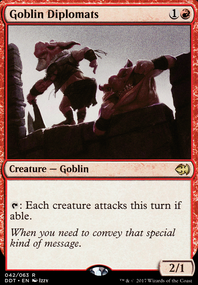 I don't think it was really until urza's block that red came to the forefront. and what a forefront it was. Wake of Destruction. as in, "see that mono colored deck over there? END THEM." I totally agree that there's a little overkill between Urborg, Tomb of Yawgmoth, Contaminated Ground and Evil Presence. The benefit of Urborg, Tomb of Yawgmoth that the others don't have, is that it's free and it will be awesome if I get it out early. 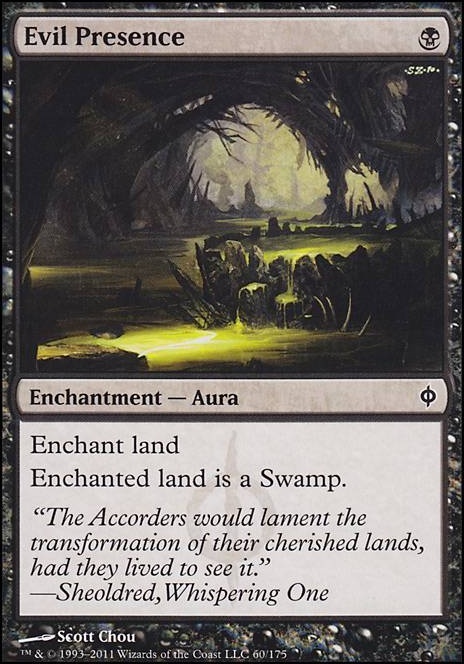 The downside to the card is that it turns lands into swamp, in addition to their other type, so it is only there for swampwalk. Both Contaminated Ground and Evil Presence will actively stunt their mana growth and because there are enough of them, it is likely I will get at least one or two in early game. 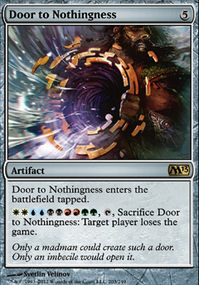 I can totally see why that renders Urborg, Tomb of Yawgmoth a bit useless, but I may play test this a bit more once I can afford all the cards to see if it's really even helping. I see what you're saying about Sword of Light and Shadow. I think I'll have to take a closer look at some other options. I think there's an interesting tension between Urborg, Tomb of Yawgmoth and your Contaminated Ground and Evil Presence. Urborg basically turns those into dead cards (though you still get the life loss from Contaminated Ground). I don't know if that means get rid of Urborg (though I do think if you use it, you want more than 1), but it is something to think about. I think you would benefit from some targeted discard and removal. 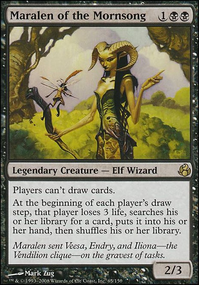 Inquisition of Kozilek is pretty great (and not too expensive), and Raven's Crime could be a nice discard outlet for you to get rid of cards that might be dead in your hand. I'd suggest Fatal Push, but you can't reliably count on losing a permanent to extend it's reach. Maybe something like Victim of Night? I don't know if you're looking at Sword of Light and Shadow for the protection or it's ability, but if it's for the protection, I might suggest one of the swords that does not give you protection from black. If your opponent has a black creature, they have a swamp, and so your swampwalk creature is already making it through (and I don't know that any of your creatures are so unique and powerful that you need to save them from a kill spell). But if you play, say, Sword of Body and Mind, you can now sneak past that Tarmogoyf whether or not you've been able to turn their lands into swamps. Thanks hungry000! Good point about the sideboard, I added a couple of Thoughtseize. I forgot about Evil Presence, I'll consider that as well, but I'm not sure what to cut!